Smaller Worms-related stuff goes here. Disclaimer: the information and files provided on this web-site is without warranty of any kind, and in no circumstances shall the author be held responsible for any damage resulting directly or indirectly from the use or misuse of this web-site's content. This program can generate Water.dir files with a customized color palette. To use it, install WormKit and its FileOverride module. Save your generated Water.dir files to C:\Team17\Worms Armageddon\Data\Water\Blue\Water.dir (adjust paths accordingly). If the folders Water and Blue don't exist, create them. 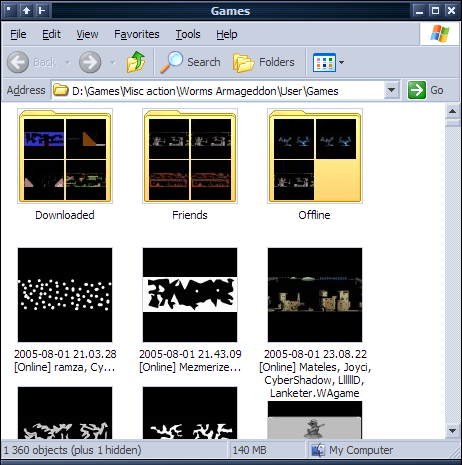 Extends the Windows Explorer shell to display thumbnails for BIT maps, and replays of games with PNG and BIT maps. Download replaypreview.zip, unpack it to a folder and run install.bat. Warning: opening your User\Games folder in Thumbnails mode might not be a wise thing to do - generating a lot of thumbnails will create a significant stress on the system, so expect about 5-10 minutes of lagginess if you must preview ~1000 replays in a folder at once. Install the shell extension by running install.bat, or re-install it if it's disabled. In Apply onto, select This key and all subkeys; in the Permissions table, check Set Value and Delete in the Deny column. Click OK. A new "Deny" permission entry should appear in the Permission entries list. Click OK once to close the Advanced Security Permissions dialog, and OK again to close the first Permissions dialog. After following the above steps, your HKEY_CLASSES_ROOT\Team17.WAgame key should be protected from modification and deletion - you won't be able to modify it from RegEdit either. If you need to, first adjust the security permissions (simply grant your username Full Control permissions to the key).